Day 12 was the final field trip of handler training and the day before graduation. We went to SeaWorld. 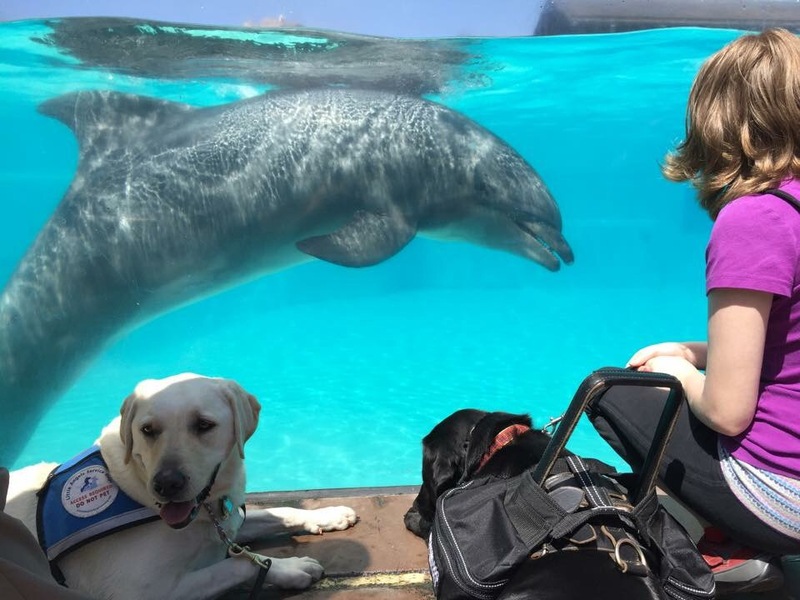 Although I don’t really like SeaWorld’s methods, especially the whole orca whale situation, it was an important training opportunity because of the large crowds, animals, and various sensory stimuli such as seeing rollercoasters, hearing yelling riders, and walking next to spilled food on the ground. It was a big group that went: Savannah with Vince, Leslie with her husband and Bud, Judy with Daisy, and me with Dyson and mom. Dyson did so well with all the new experiences. I don’t think he’d ever seen most of those aquatic animals before, been in as big of a crowd, or seen rollercoasters. Dyson and Bud were the best behaved dogs in the group. Vince, who is still in training, cried when we passed the rollercoaster. I was so proud of Dyson and his good behavior. I rewarded him with treats throughout the day. 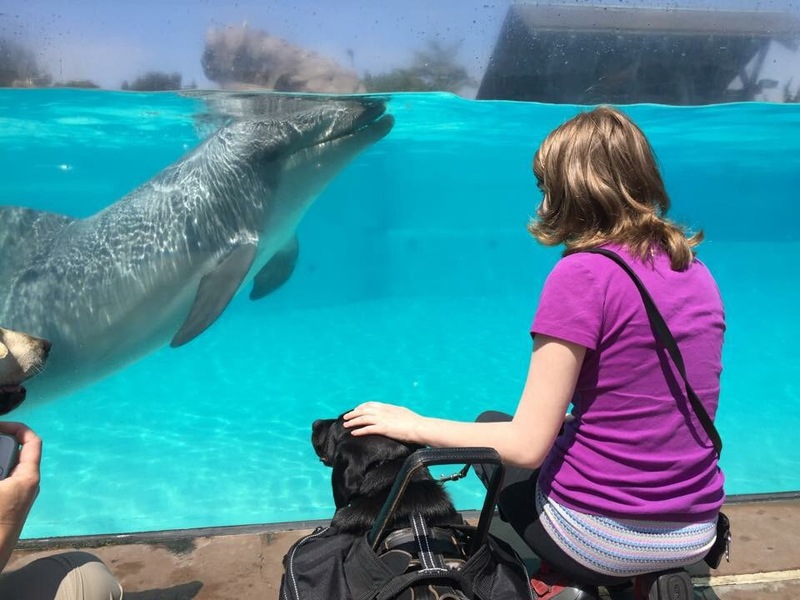 Dyson got to see so many aquatic animals up close, particularly dolphins and otters. He didn’t seem too interested in them. I used a wheelchair like I usually do at theme parks. There is always so much walking and lots of heat, which make my symptoms increase quickly. This was the first time I worked in a wheelchair with Dyson while in public. He did really well. We stopped at grassy areas to let our dogs go potty. Savannah and Judy had to leave the park earlier on, but the rest of us stayed together. 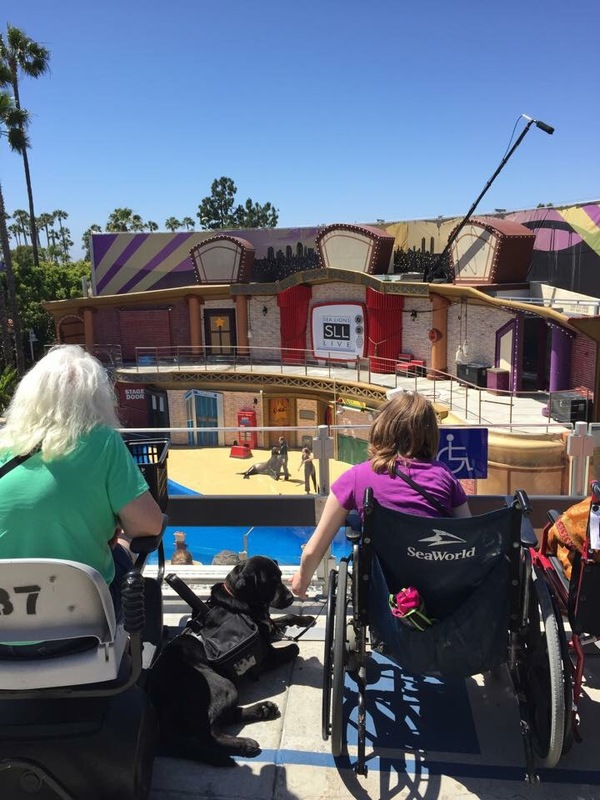 We went to a show where sea lions and an otter performed cute little acts with their trainers. There weren’t many wheelchair accessible seats, so Dyson and I had to sit a few rows in front of the rest of the group. We also went to the arctic exhibits, where we saw beluga whales and various types of penguins and puffins. Dyson and Bud often rested next to each other. So many different people were interested in Dyson at the park. I could see their eyes following him around. It was kind of silly to me because labs are the most popular dog breed in America, and you can see them all the time, so why pay attention to him when you could instead be seeing less common animals like whales? Kids were especially into Dyson. 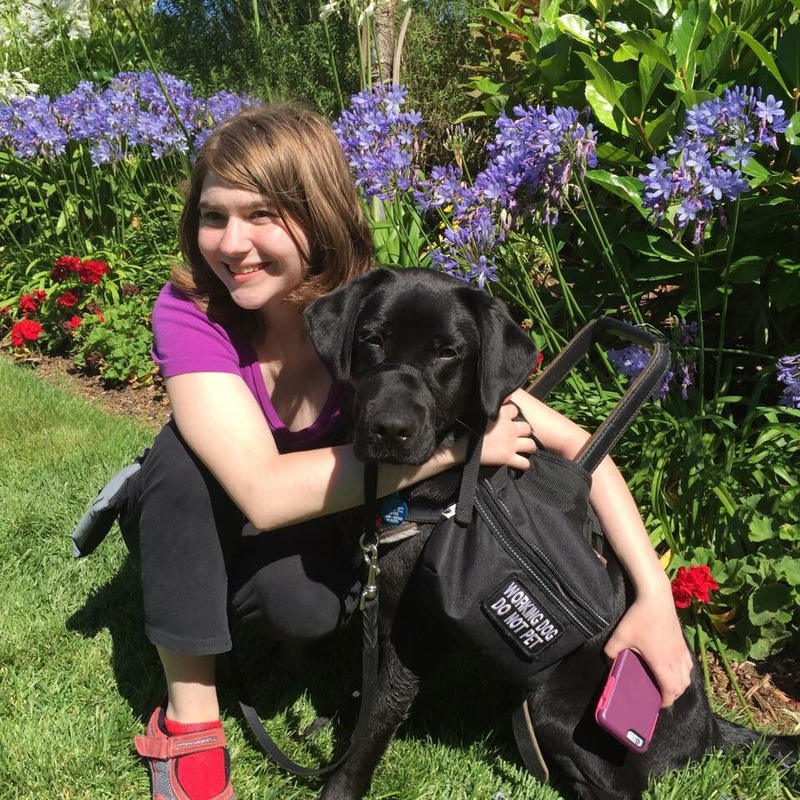 Some adults noticed their kids about to pet him and stopped them, which I appreciated, even if I could hear them incorrectly teaching their kids that Dyson was “in training” or a “guide dog.” Handler training is more about training me; Dyson has already been trained by Little Angels. Furthermore, he is not a guide dog (like a seeing eye dog), but rather a service dog. He could be called a mobility and medical alert service dog, although the specification isn’t necessary. In the shark aquarium area, one kid grabbed his tail and another grabbed his snout. When in a wheelchair, unfortunately I can’t walk away or circle Dyson to my other side as quickly as otherwise to indicate “hands off.” Dyson ignored the rough touches, although I’m sure they were startling and unpleasant. The children kept acting like it was a game to tap the dogs and dart away as quickly as possible. I had to tell Leslie a few times when kids touched Bud’s tail. These touches can happen so quickly that I’m sure some occurred without me noticing. One girl stood out among the petting children. She asked if she could say hello to my dog, but as I was saying no, she pet him anyway. This really frustrated me. Why ask if you don’t care about the answer? Kids are old enough to understand a no. And then, a minute later, she ran back up and pet him again. This was really irresponsible and frankly a rude thing to do. If she had been an adult, I would’ve been a lot firmer with her. There was only a single kid that pet Dyson who was too young to understand if I were to say some variation of please don’t pet. I kind of had to wait it out until his parents finally noticed, because most parents would probably get mad if I picked up their baby to move them off of my dog. I’m polite with people who ask questions or approach Dyson, especially the first time, but if they blatantly disregard what I say and continue to distract my dog, it’s often necessary to be more blunt and uninhibited. When I say that people can’t pet my dog, I’m not trying to be rude. When I take my pet dog on walks I love stopping for her to meet other dogs and be rubbed by their owners. But Dyson is a service dog, not a pet. 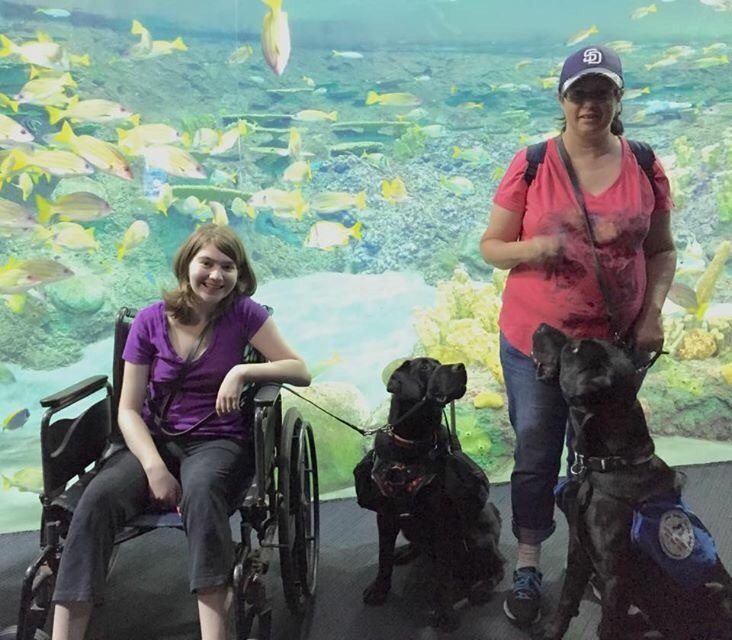 There are multiple reasons why it’s not okay for people to touch or distract service dogs. The Little Angels trainers taught me one of the reasons for this: If people frequently interact with Dyson in public, then he will think it’s okay to seek out attention. This could lead to him to pulling, barking, or otherwise misbehaving in an effort to approach and socialize with people. 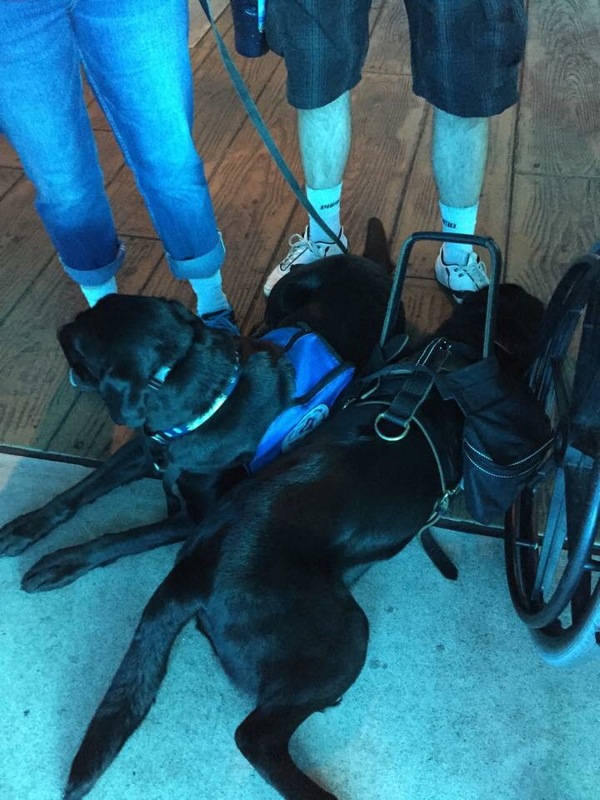 This would lead to him not being fit for public access since service dogs have to be non-disruptive. Although this is a possible long-term effect, it’s important to enforce it now so it never becomes a problem. 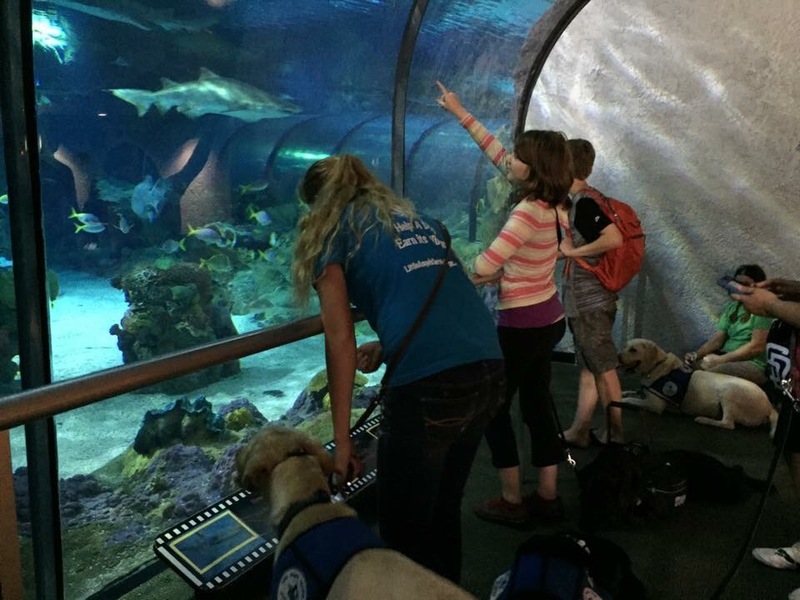 There are other more immediate reasons why people can’t distract service dogs, as well. Dyson is supposed to be ready at all times help me. He would be too distracted and confused to follow commands if different people were talking to him (example: “hey doggy!”) or interacting with him. Service dogs aren’t robots. No matter how intelligent and trained they are, they can make mistakes just like humans. Additionally, people can’t touch Dyson for my own safety. I use Dyson to brace and balance, so if he were to take a wrong step when investigating someone distracting him, I could trip and fall. Furthermore, it’s an issue of courtesy and respect. 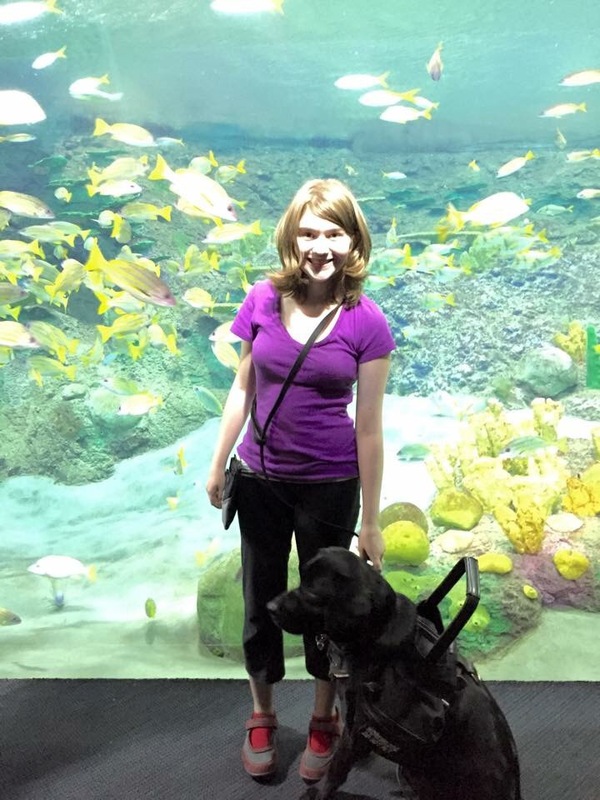 A mobility dog like Dyson is a form of mobility equipment like a wheelchair or walker. These are extensions of the disabled person’s body, and it would be rude for a someone to lean on a stranger’s wheelchair or roll someone in one aside. The same goes for interaction with a service dog. 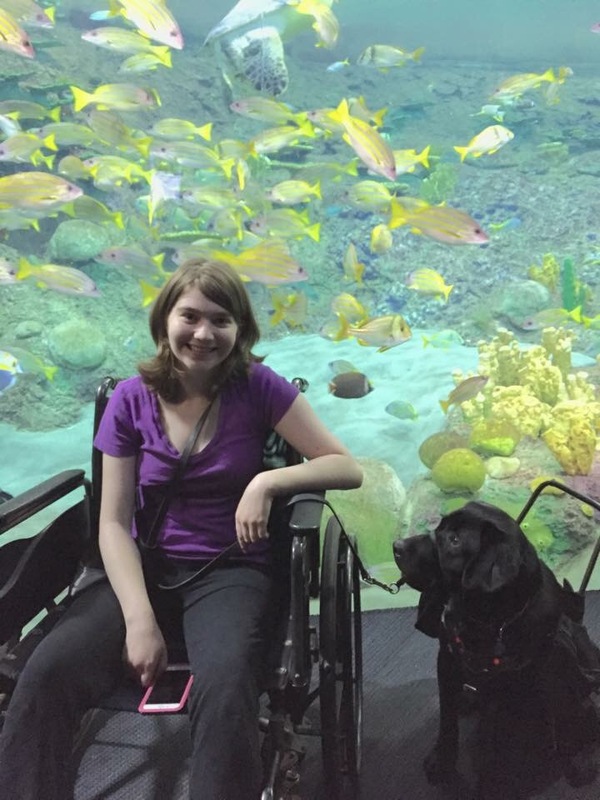 Does all of this mean I will never let someone pet my service dog in public? Of course not. But those occasions will be uncommon. There was a single person that I allowed to pet Dyson at SeaWorld. He was a curious little boy in line next to me at an ice cream stand. The kid was really adorable and polite, plus it was a good opportunity to teach him about service dogs, so I was more lenient. I was standing still and leaning against the check-out counter which meant that I was supported without relying on Dyson for balance. The situation was at a safe and acceptable moment: I didn’t need Dyson’s help, Dyson was already resting for a minute, we were away from crowds, and it was the end of the trip when there was no rush. However, just because a similar situation arises in the future, does not mean I’ll allow someone to pet him. Most likely I’ll say no because I can’t get Dyson used to receiving or seeking attention from people other than myself while he is working.